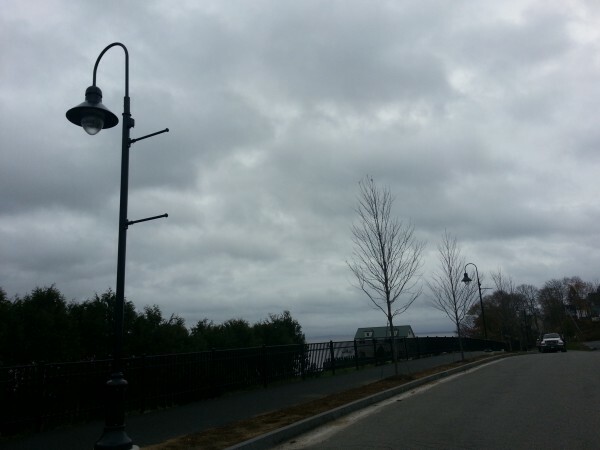 Many residents have complained that the new street lights on the Belfast Harbor Walk are just too bright. City Councilors agreed to dim some of them at Wednesday night's council meeting. 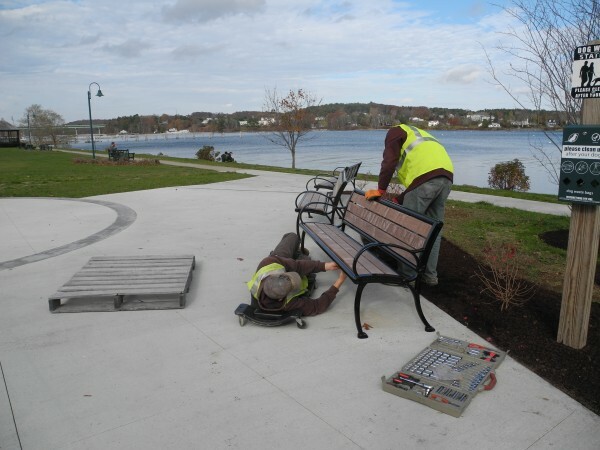 Shawn Chapman of Hermon, left, and Colt Van Aken of Hampden work this week to put some finishing touches on the new Harbor Walk. Belfast will hold a grand opening for the walkway, which was many years in the planning, beginning at 10 a.m. Saturday, Nov. 9 at the Belfast Boat House. BELFAST, Maine — City councilors have heard from residents pleading them to turn down the bright LED street lights that illuminate the previously dark skies around Steamboat Landing park and the waterfront. And the councilors want people to know they’re listening. At the regular Belfast City Council meeting on Wednesday night, councilors decided to alter 10 of the lights along Front Street by changing an internal reflector. This should reduce the brightness of the lights and also limit the illuminated area below. That’s crucial, according to City Councilor Mike Hurley, who gave an impassioned speech about the controversial lights. City Manager Joe Slocum said that it will cost $153 per light to install the lower brightness reflector. If that’s not enough, the council can consider spending $127 per light to install a “solid state resister” to further reduce the amount of light emitted. Belfast City Planner Wayne Marshall told the council that there are 36 streetlights altogether on the path, which stretches for more than half a mile from the Armistice Bridge to Steamboat Landing Park. He said he has heard that owners of businesses located near the walkway, including waterfront restaurants and the Front Street Shipyard, love the bright streetlights. He cautioned councilors not to make changes to the whole path that would go against the best interest of the public. The questions about the lights come at a time when work crews are just putting final touches to the long-planned Harbor Walk, which will host a ribbon-cutting ceremony and official kickoff walk beginning at 10 a.m. Saturday, Nov. 9, at the Belfast Boat House. The $1.5 million pathway has been in the works for years, and links some local destinations that include the footbridge, the harbor, Front Street Shipyard, several restaurants, shops and the waterfront parks. Part of the path is a wooden boardwalk that connects the footbridge with the shipyard while running over the water. On Wednesday night, the councilors also heard a presentation about a concept to enhance Cross Street and create a more welcoming and obvious entrance into Belfast Common. The city received a $500,000 downtown revitalization grant to do some of this work. Consulting engineers Sebago Technics proposed to make Cross Street partially one-way, to create more parking spaces and to install some sort of eye-catching sculpture at the entrance to the park. They suggested adding street lights, crosswalks, benches, plants and signs to make it more obvious to Main Street pedestrians that Cross Street will lead them to a nice city park. The engineer’s estimate for doing the work is $627,165.